I’m on On Lan Street (Hong Kong), meeting the founders of the clothing label, Billionaires Boys Club (BBC), and the sneaker brand, Ice Cream. One half of the dynamic duo is production genius and icon Pharrell Williams, who no longer needs an introduction. For the less clued-up, Pharrell made himself a name as the lead singer of his band, Nerd, and as producer with The Neptunes (which includes partner Chad Hugo), creating one hit after another for musicians such as Timberlake, Snoop, Usher, Diddy, Britney, Kelis, Alicia Keys, Gwen Stefani and Jay Z to name but a few. The list is endless. Pharrell dominates the global music scene, and today he has his own radio hits. He’s getting the same attention as his friend Snoop, if not more. But music isn’t the only metier he feels comfortable in, as fashion and music are starting to merge. The other half of the brilliant combo is Japanese fashion icon and A Bathing Ape founder and designer Nigo. Nigo seems to be less outgoing and more reserved than Pharrell, but nonetheless he has a great following in Japan, where he is worshipped like a rock star, and his fame in the States is growing rapidly thanks to his buddy Pharrell. Nigo has his fingers in many pies. Apart from supervising his numerous divisions of A Bathing Ape, including Bape Play (the toy division), Bape Cuts (the hair salon), Baby Milo (the children’s clothing line), Bape Galley (the art gallery), Bape Café (the restaurant), Bape TV (the TV program) and Ape Sounds (the record label), Nigo is also in charge of the design for BBC and Ice Cream. The interview is taking place inside the new BBC and Ice Cream store, which looks like a rocket on the outside and resembles outer space on the inside, featuring a Milky Way ceiling with stars and a floor resembling the surface of the moon. I literally find myself in the tip of the rocket at the very top of the store, waiting for Pharrell and Nigo to arrive. Eventually Pharrell and Nigo show up. They arrive with their entire entourage in tow, including producers from Star Trak (Pharrell’s record label), PAs, translaters and so on. They all come to gaze at the new store and to catch a glimpse of Pharrell’s and Nigo’s world. 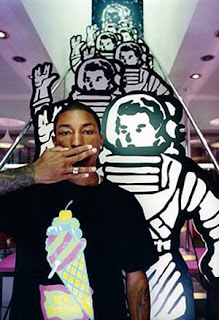 But Skateboard P (he owns a skateboard team) and Nigo both seem very low-key, dressed in casual jeans and sweaters, none of the bling that we are so used to from all the Hip Hop video clips, except maybe for Pharrell’s chunky ring, which he flaunts on his right hand. The gathering reminds me of a bunch of friends hanging out at someone’s apartment. Everybody just seems so comfortable with each other, unlike the usual business environment you experience with other brands. After everybody has shown their enthusiasm, expressed their admiration for the boutique and asked for directions to the nearest Hermès store, the crowd trickles out. I’ve waited the last six years to meet the genius, heck what are another two minutes? Finally the swarm leaves, and I can start the interview. The adoration and respect for each other’s work is limitless and probably also the driving force behind BBC, Ice Cream and other previous projects such as the Louis Vuitton collaboration for a range of sunglasses. The two creative heads almost seem like long lost brothers, sharing a love for science fiction. Their shop is like Disneyland for grown-ups, who haven’t lost touch with their inner child. Much like Pharrell himself, whose childlike charming innocence and artistic mind, reminds one of a young boy. Paired with the ambition and initiative to visualise, manifest and transform his dreams into reality, he is a true genius. “We both love the experience when you walk into something like a Disney World,” says Pharrell. “When you walk into an Ape store, you walk into his idea of how he wants his clothes and sneakers represented. BBC follows that same mentality. When you walk in here, we want you to feel the way we feel, when we are creating it. This is kind of how Nigo and I met, but to me, that still feels new. Nigo is my friend, in fact our whole team…we’re all friends.” What Pharrell refers to as the team, is a bunch of highly creative talented people, having a great time, sharing their ideas and letting others be a part of their world and vision. The two brands consist of T-shirts, polos, denims, suits, shirts, hats and sneakers and are produced in limited quantities. They are well-known for their bright colours and most of all for the BBC symbol, the iconic astronaut logo. Instead of sporting a crocodile on your polo, you can now have something much cooler and trendier. BBC connects the worlds of wealth and the alternative anti-money culture with slogans, such as “Wealth is of the heart and mind, not the pocket.” BBC and Ice cream are high-end luxury sports brands for the sophisticated yet young at heart. The clientele is largely male, attracting guys, who are looking for something unique, something cool and somewhat underground, guys who like mixing with the creative crowd, like Pharrell and Nigo, The Billionaire Boys. Pharrell humbly apologises to Nigo for taking so much time to answer the question and drawing the attention away from him. But once Pharrell starts elaborating about something he feels passionate about, things can take a while. It’s as if everything around him stands still and everybody listens and get’s sucked into his idea, teleported into his world, Pharrell’s Disneyland. His vision is so clear, so pure. It’s heaven.